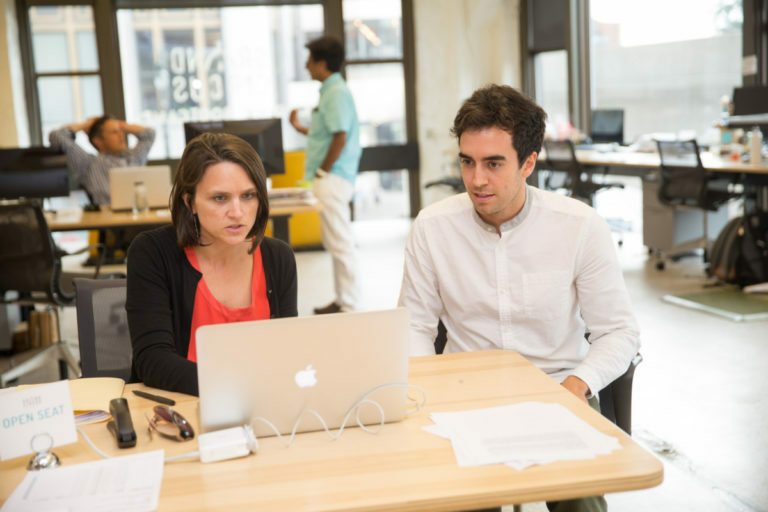 The investment Grand Circus (GC) has in the city of Detroit extends beyond accessible technology bootcamps and IT programs; their passion for the next generation of technical professionals fuels the Detroit hustle and stimulates the city’s economy. Located at 1570 Woodward Ave, the devoted teams of Grand Circus instructors seek to develop the professional careers of each student by providing exposure to a rich network of local employers. While Grand Circus offers an array of unique bootcamp coding courses, we sought out four individuals who graduated from GC’s most popular bootcamp, Front-End Coding. The following is the experiences of the four GC graduates, how they learned about the program and where they are as a result. Smith attests the importance of computer coding, and furthermore, the impact of GC in this specific field. Currently, Smith is employed at Carat in downtown Detroit, where she works as a junior data technology specialist. “Grand Circus allowed me to acquire the skills set to land my present job,” Smith said. Shugmi Shumunov is another Grand Circus grad that took the Front-End course. He’s a Wayne State University grad who was interested in a field change. Shumunov graduated GC in August 2016 and currently works at GTB, designing websites as a junior web developer and technology intern. “Grand Circus gave me the entire foundation and skill set to do that. I just wanted to be a part of Detroit because of the tech scene. I think a lot of industries don’t really do things like the tech industry here in Detroit does,” added Shumunov. “I came out with definite confidence in my skills,” said Proctor. He went on to say how GC provided countless opportunities for their students to meet potential employers. “Before I took my current job, I had four interviews within three weeks of the bootcamp ending and I just don’t think I would’ve gotten those interviews without a Grand Circus connection to it.” Proctor began his job at LevelEleven in November of 2015. Kwaku Osei-Bonsu also sought a career change and a fresh start, moving back to his hometown in Detroit in November of 2015. After researching major cities like Atlanta and New York, Osei-Bonsu found Grand Circus to be the best resource for a coding bootcamp. In January 2016, he took the Front-End Web Development Bootcamp. “I was able to start building my own projects and freelancing jobs almost immediately,” said Osei-Bonsu. He credited Grand Circus’ extensive business network and strong alumni program. “I landed my current job through a Grand Circus alum that was already at Meridian,” said Osei-Bonsu, now a software engineer for internal processes at Meridian. Grand Circus provides intensive learning experiences that translate to real-world knowledge and career application. Emphasizing teamwork, paired programming, and incomparable technical skills, GC gleans their students for coveted company positions, with graduates at Blue Cross Blue Shield of Michigan, Title Source, DTE Energy, and Meridian. According to the website, over 200 Grand Circus bootcampers graduated in 2015. The turnaround rate for career advancement speaks through their extensive alumni network. Whether they encounter a recent college graduate with a degree in computer science or a seasoned company worker that dreams of entering a new industry, Grand Circus is designed to provide endless opportunities to advance the goals and aspirations of their applicants. .NET (C#) Coding Bootcamp will teach you programming for enterprise development. 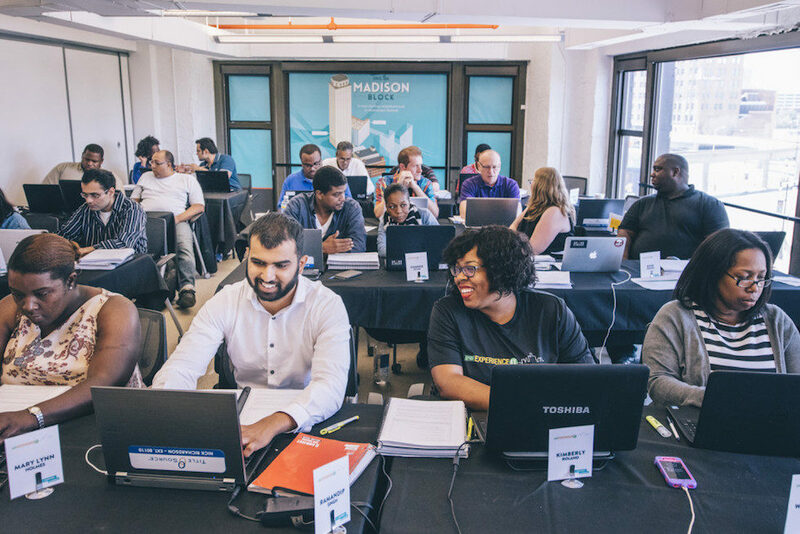 Lastly, the Java Coding Bootcamp will teach you Java, the most in-demand language for employers in the U.S.
Stay up to date with all the exciting developments at Grand Circus on Facebook, Twitter and Instagram.